Close to two years ago, we began writing material for a new album. It was exciting for us as not only had Benjamin Schaefer just joined us on percussion, we entered the process with a blank slate. Full of ideas that had been placed on the back burner in the time following the release of For Highbrow Sideshows and Rowboat Serenades, we were eager to explore the sounds that a new collaborative process would create. Lady of Stone is the first of many new songs that were born out of that initial writing process. Last summer, we got the opportunity to shoot a music video in the historic Riverside Theater, and selected Lady of Stone. Rather than performing to a pre-recorded soundtrack, we elected to capture the performance live, working with the Riverside’s sound engineer, Simon Bundy. Video production and editing was handled by Blend Studios. 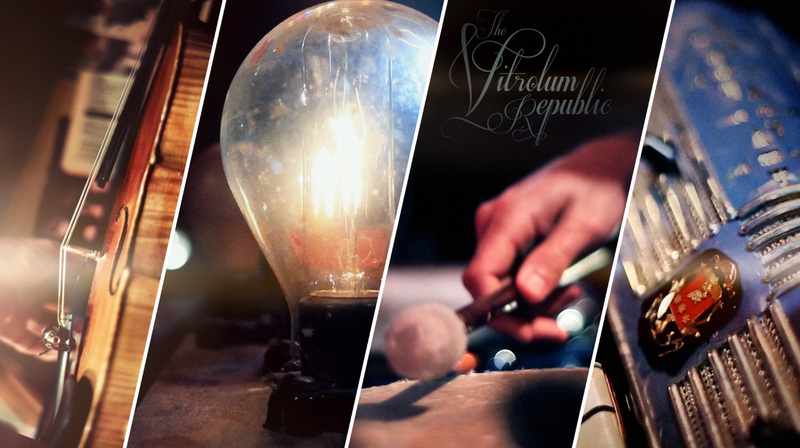 The result is a beautiful video that captures the essence of our music, the textures of our aesthetic, and serves as a new introduction to The Vitrolum Republic. We can’t wait to share with you where we go from here. You have some serious fans out here in Horicon! Hope we’ll be able to see you play live out in the marshlands again some time! You guys are incredible! One of Milwaukee’s home-grown music treasures. So excited that Tracy Bredow found you guys for our Denim Park music series, and hope that you’ll join us again next summer.